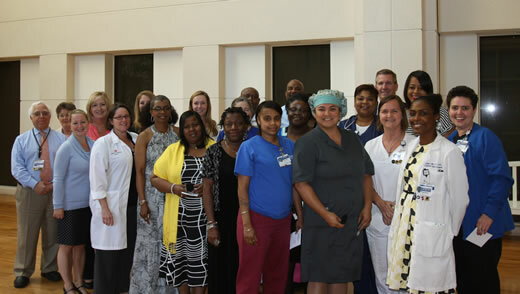 Emory Saint Joseph's Hospital honored more than 240 employees for their years of service to the hospital and Emory Healthcare at a recent awards ceremony. The program recognized individuals for each five years of continuous service completed. Janice Sprock, with the Access and Transfer Center, was announced as the longest serving employee, with 40 years of service. During the program, each employee was individually recognized by the hospital's senior management and presented with a Saint Joseph's cross pin. "This event is a great opportunity to celebrate and express Emory Saint Joseph's appreciation for your commitment," said Craig McCoy, CEO of Emory Saint Joseph's, addressing the honorees. "You impact our patients and families each and every day."